Adulthood isn’t all it’s cracked up to be. There are bills to be paid, work to be done and calories to count (lame). On top of everything else, it becomes harder to meet up with your friends. Getting together with my gal pals used to take a quick phone call (on a LAND line) or a five-minute walk. Now, lunch with the girls requires weeks and sometimes months of planning, eight e-mails, a few Twitter DMs, GPS (or Google Maps), babysitters and bridge tolls. I like to think of today’s Unsung Hero as a master of improvisation. Shimmery golden khaki MAC Sumptuous Olive ($15 for a regular eyeshadow; $11.50 for the Pro Refill Pan shown here) is one of my favorite “improv” shades. 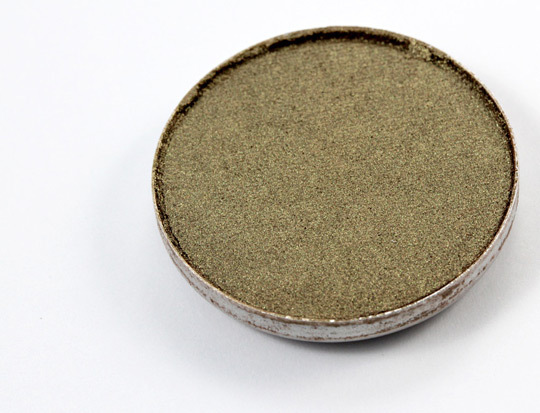 Like, if I were to withdraw a handful of random colors from my eyeshadow drawer, Sumptuous Olive would probably go well with any of them. I love the way it looks with gold, brown, bronze, beige and black, but I also think it works with many brighter colors, too, like purples, pinks and blues. 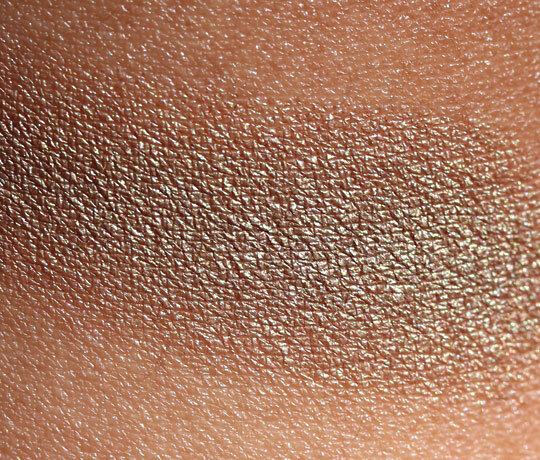 I feel it’s one of the most versatile shades in the MAC eyeshadow line. Sometimes, when you just want to stick your hand in the drawer, randomly pull out a few shades, and “make it work,” Sumptuous Olive Eyeshadow is a great companion to do it with. 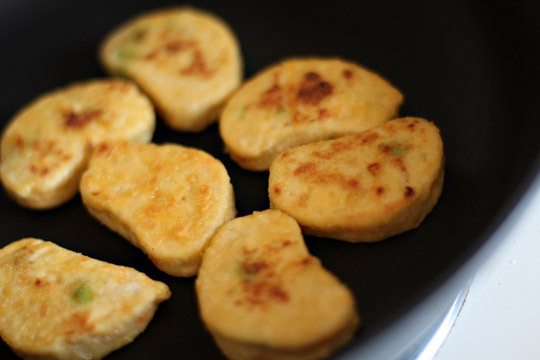 Have you had the Tofu Edamame Nuggets from Trader Joe’s? They’re my new favorite snack (this week). Great for a quick bite, or, served with soup, salad and/or rice, a full meal. Previous Post: What’s Your Favorite Decade or Era of Makeup and Beauty? I love your MAC unsung heroes posts! But then again I love all your posts! And surprisingly those little nuggets look really good. Still lamenting my lack of a Trader Joe’s. How are you doing? Got any plans for the weekend? Sumptuous Olive is one of those ones that’s always on my list, but I never get. I just don’t know why. And yum! I could have used those nugget things tonight as I needed something to go with my soup. I just bought this the other day. I love it for spicing up a neutral look will still being daytime appropriate. Mmm…. 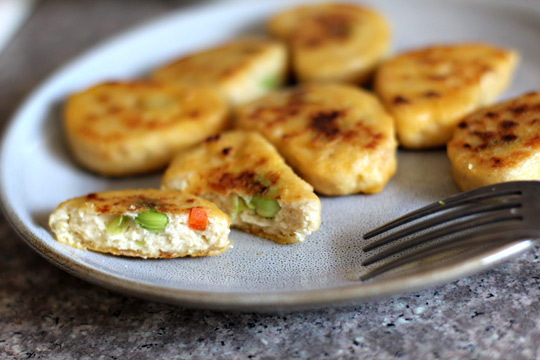 I haven’t seen those Tofu Edamame nuggets before. I’m going to Trader Joe’s tomorrow, I’ll be on the lookout for them. I’ve never tried Sumptuous Olive. It looks gorgeous but I never know if these types of shades will be too “matchy-matchy” with my eye color. They’re green with a lot of gold in them. I have them, but I haven’t made them yet. What preparation do you recommend? I love your Mac Unsung Heroes series. oh totally unsung … it can be a bit intimidating in the pan, but on the lids, its nothing but gorgeous! I just made those edamame nuggets for dinner last night! So delish! All your TJ favs are mine too, I love it. I can’t wait to try your corn soup recipe! Love your MAC unsung heroes postings! And I do love Sumptuous Olive! 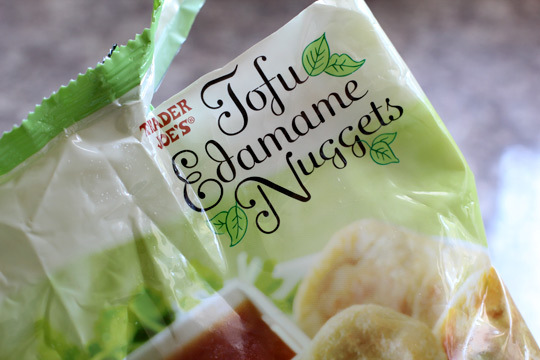 Also, those tofu edamame nuggets sounds delish but too bad for me…no Trader Joes in Hawaii 🙁 I’ll just have to drool over your pics. I got this back in July and still haven’t worn it (I know, shame on me!) for some reason everytime I looked at it I got scared it’d look horrible. Tomorrow’s the day! Love this one! Gorg :). Erin recently posted … Selling my soul to the corporate world. For my senior prom I got a MAC pallet made to match/compliment my dress and this was in there 🙂 Its the exact same color as my prom dress! Totally one of my favorite eyeshadows. Oh my goodness, you rock my socks off!! Thanks for posting this, I was just staring blankly at my own palette with Sumptuous Olive in it, noticing I’ve given it a bit of the shaft lately. The Unsung Heroes posts are by far my favourite part of your blog (and the cat posts! And the Ryan Gosling graphics lol). I love your humour and honesty. You are by far my favourite beauty blogger! I want that eyeshadow… and your nuggets! I love this shade. I have it and totally never remember to use it! I should! Gorgeous color, looks great on your skin tone! Those nuggets look pretty yummy..and anything with the word nugget in it is just awesome. Just stumbled upon your blog today. I’m definitely gonna come back for more! Your blog posts are pretty great. 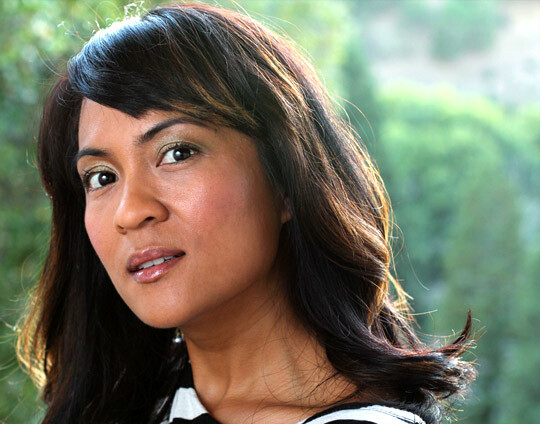 I like to try different eye shadow colors and use the makeover on Taaz.com to see what might look good on me. 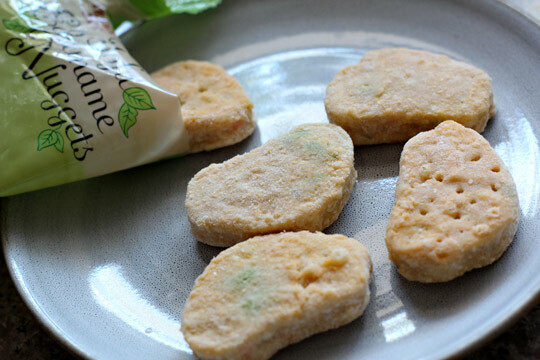 Oh my WORD, those TJ’s Edamame Nuggets are to DIE for….so yummy! And a great source of protein and veggies! Yum!! Hey, Karen! I was wondering–would you recommend buying a regular eye shadow or a refill pan? Not just for this shade but for in general? Thanks!